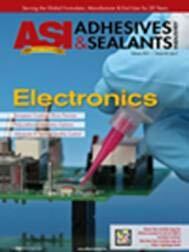 The following article originally appeared in the February 2013 issue of the Adhesives & Sealants Industry magazine. In today’s advanced electronics applications, adhesives, encapsulants, sealants, and other chemistries can be the “horseshoe nails” of mission-critical electronics systems. These chemical formulations play an increasingly important role in assuring not only that the assemblies function as intended, but that they will remain functional in highly adverse conditions for their intended life. In medical, defense, aerospace, industrial or transportation electronics applications that support high-reliability or mission-critical functions, the failure of an adhesive, coating or encapsulant can have dire consequences. Historically, original equipment manufacturers (OEMs) of high-reliability products have taken one of two paths. The first path was to develop their own application-specific formulations and produce those internally, typically in frequent, small batches. This option required substantial investment in engineering and technical labor, production and test personnel, capital equipment, and facility space. This option also required a strong focus on chemical management, quality management and verification systems, regulatory compliance costs, and waste stream management costs. The second option, which has emerged more rapidly over the past 20 years, is collaboration with specialty adhesives manufacturers and chemicals management providers. These collaborations can range from simple “down packaging” of industry-standard formulations into smaller-sized, ready-to-use formats to the modification of standard formulations or even the ground-up customization of adhesive materials. Increasingly, OEMs are establishing true partnerships with specialized chemical formulators and manufacturers to co-develop custom formulations, or to fully outsource materials development, fabrication, testing, and packaging of highly advanced application-specific formulations. An interesting manifestation of this evolution has been the emergence of precision-mixed and frozen (PMF) formulations in ready-to-use syringes and cartridges. PMF products are typically multi-part chemical formulations specifically engineered for high-reliability electronic applications. PMF producers usually assume full responsibility for the sourcing of raw materials, materials management and storage, materials mixing and processing, full quality testing and verification, and final packaging of a ready-to-use formulation in either a handheld syringe or cartridge format suitable for higher-volume automated or semi-automated applications. In addition, premier PMF providers often provide post-manufacturing product verification services, whereby product samples of all shipped materials are retained for their usable shelf lives in safe storage at the PMF provider. Further, witness samples of cured PMF materials can be retained for up to 10 years in the event that post-application analysis is required. These services are valuable in many mission-critical applications to assure that PMF materials comply with specifications from the date of shipment and up to 10 years into the future. Over the past 30 years, the majority of manufacturers have moved away from vertical manufacturing strategies in which they source, manufacture and internally control all components of their end products. Similar to the trend that has seen manufacturers outsource circuit board assemblies, metal and plastics fabrication, as well as many other sub-assemblies, the use of PMF products offers manufacturers multiple advantages over in-house processing and packaging. Today’s manufacturers overwhelmingly favor investing their limited capital and personnel on areas they view as core competencies. Very few large equipment OEMs today view chemical formulation and processing as internal core competencies. Further supporting this trend is the fact that the majority of today’s OEM manufacturers, and contract manufacturers to OEMs, have a relatively sophisticated understanding of total cost management. Thirty years ago, a purchasing leader would compare the cost of raw materials to the cost of a pre-processed material, and recommend internal fabrication. In today’s environment, the case is far more often made for leveraging the capabilities of specialized suppliers in the supply chain. Specialized chemical manufacturers offering PMF formulations are actually providing OEMs with significant savings related to product quality and repeatability, process time savings, and dramatically reduced overhead and compliance costs. This is particularly true in the manufacture of highly complex products supporting mission-critical functions. As chemicals such as adhesives, conformal coatings, encapsulants and thermal transfer materials are typically applied at the end of a manufacturing process, any errors associated with poor material quality can result in expensive rework, scrap expenses, or—worse yet—product liability exposure due to product failure in the field. Another distinct advantage of PMF materials is the ability to ensure continuity of supply. In many cases, the PMF provider will offer manufacturers some level of “safety stock” in their own fault-tolerant freezer facilities to allow for unforeseen events such as processing errors, power outages, or spikes in demand. Lead times for raw materials can be many weeks, while PMF products managed under a safety stock program can be procured in hours or days. PMF materials manufacturers offer OEMs a wide range of benefits, such as extreme blending and processing accuracy, material degassing, raw material and finished materials verification testing, application repeatability, and product genealogy (traceability), to ensure every batch and nanoliter of material within each batch is identical in nature. All of this is accomplished in a manner that provides for maximum pot-life retention. PMF formulations are used in a variety of applications, ranging from automated bonding processes, staking of materials for secondary assembly processes, high shear strength bonding, hermetic encapsulation, thermal management, electrical and/or thermal conductivity or isolation, and many others. As electronics and packaging engineers continue to develop ever-more densely packaged electronic assemblies, the need for highly engineered adhesives, encapsulants and coatings becomes critical to the function of the finished assemblies. These highly engineered formulations are often custom-developed materials that consist of two, three or more discrete chemical materials that must be precisely measured, processed, blended, and packaged prior to use. Precision-mixed and frozen materials that are formulated and compounded by specialized providers offer manufacturers a reliable source of “known-good” materials that can be sourced and cryogenically stored and dispensed for a year or more. As shown in Table 1, a variety of materials and chemistries can be provided in a precision mixed and frozen format, ranging from simple mixing, packaging and cryogenic processing of widely used industry standard materials (e.g., 3M 2216 epoxy), to custom-formulated, application-specific materials engineered for an exact application or a specific range of properties. Between those two extremes lies a wide range of modified or semi-custom materials that offer modest alterations to well-known, commonly used materials. One example of a semi-custom material that is optimally suited for PMF format is the many variants of the aforementioned 3M 2216. This ubiquitous, epoxy-based material supports a wide range of high-reliability bonding requirements, but in some cases has characteristics that are not perfectly suited to a specific application. Additional critical factors when considering material options are the base chemistries used within the formulations and the method used for dispensing. Table 2 outlines a few common examples and the general benefits and drawbacks of each family of materials. PMF materials that are prepackaged in ready-to-use formats offer a distinct quality and reliability advantage over competing formats, such as dual-cartridges or injection cartridge kits, due to fact that PMF materials are precisely measured, integrated and tested as a mixed material prior to packaging. Every nanoliter is exactly the same in PMF, while the opportunity exists for small amounts of unmixed or improperly mixed materials being inadvertently applied in dual-cartridge and injection cartridge packaging. As manufacturers of high-reliability or mission-critical technology products focus on improved quality, reduced risk and the lowest total cost solutions, PMF materials are playing a more prominent role in the electronics manufacturing supply chain. Premier PMF providers have the ability to custom develop materials for applications that require precisely engineered characteristics. High-reliability applications that involve harsh environments (e.g., heat, humidity, radiation or chemical exposure), exceptional bond strength, and thermal or electrical conductivity or isolation are ideally suited for the use of precision mixed and frozen materials. Although PMF products can sometimes be slightly more expensive per application due to their higher investment in processing and packaging in ready-to-use formats, the advantages of PMF materials’ ease of use, quality and repeatability far outweighs the cost savings that might be derived from internal materials processing. In fact, the majority of technology OEMs that once mixed and processed their own materials have transitioned to PMF materials as their lowest total cost, highest value solution. Listen to the podcast with Tim Walsh.